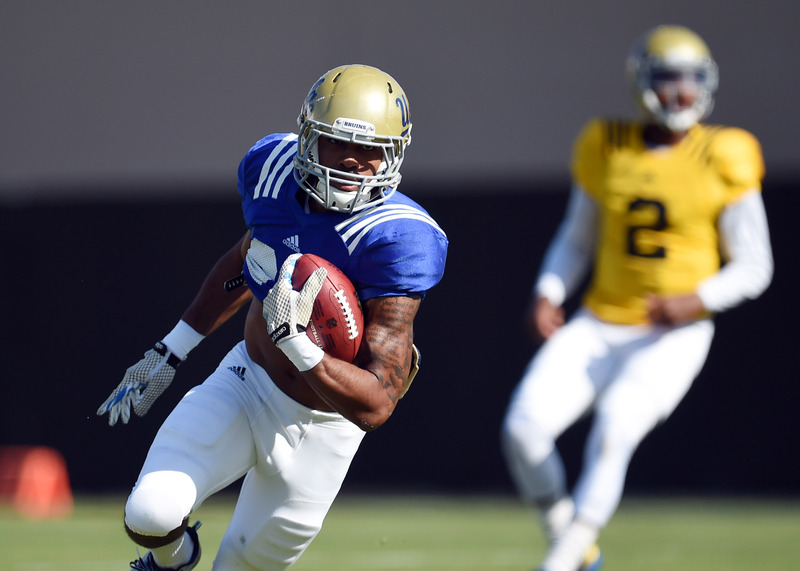 UCLA found backfield stability last season in the form of Paul Perkins, who broke out and became the first Bruin to lead the conference in rushing since 2001. As long as he’s healthy, the running game should churn along smoothly. 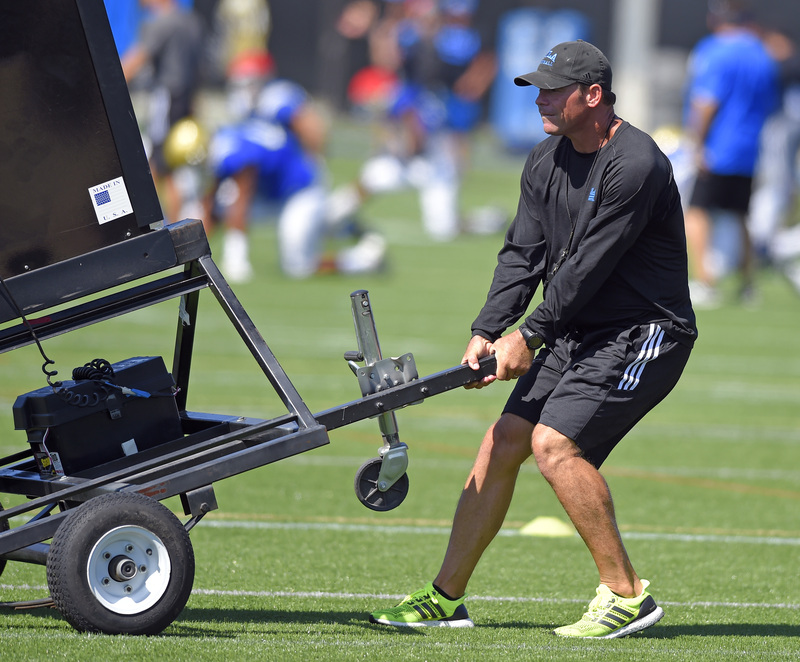 But what will make UCLA’s next quarterback even happier is the depth behind Perkins. One of the intriguing performances this spring camp came from Nate Starks, who had a promising albeit limited role as a true freshman last season. Starks only had 31 carries for 141 yards and two touchdowns, but those stats don’t accurately show how impressive some of those runs were. He also had his best game when UCLA needed him most, in a 17-7 win over Arizona. Against the Wildcats, Starks had five carries for 41 yards, including a 21-yarder on 3rd-and-11 deep in UCLA territory. He was also the primary back on the Bruins’ first fourth-quarter drive. The improvement of UCLA’s offensive line has been a recurring storyline for more than a year, so you’re allowed some skepticism as you read this: Despite allowing 128 sacks over the last three seasons, this could be one of the team’s strengths. As usual, the caveat is that the line will need to stay healthy. But unlike the last few years, the unit has the sort of depth that can sustain a certain amount of attrition. Two starters are crucial: left tackle Conor McDermott, and center Jake Brendel. The former has had shoulder problems in the past, but was a game-changing left tackle through the second half of last season. He looked healthy and capable all of spring. Brendel is still the only full-time center UCLA has had in the Jim Mora era, and the one game he missed wasn’t pretty. For a moment, he teetered on the verge of divulging some real information. After insisting for the past few weeks that no one will no the starter until the season-opening kickoff against Virginia, that felt for a moment like a softened stance. Then he remembered that he was doing a conference call in late April, and that telling anyone whether the Bruins will start Josh Rosen or Jerry Neuheisel or Asiantii Woulard or Mike Fafaul serves the Bruins themselves little purpose. 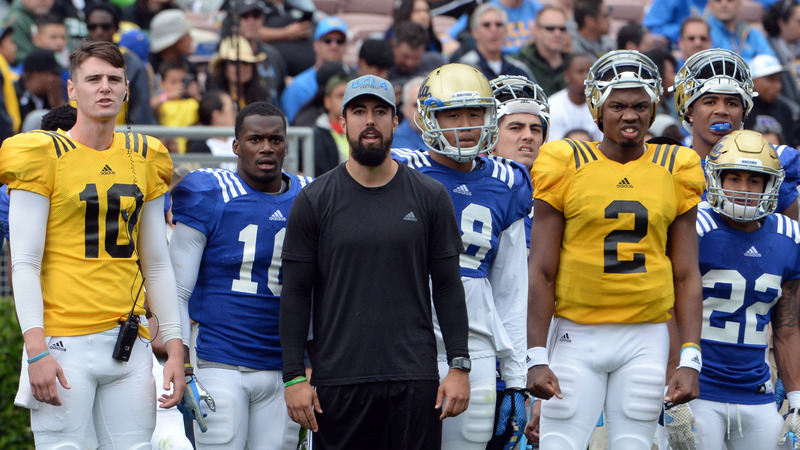 UCLA quarterbacks coach Taylor Mazzone, center, grappling with what he’s seeing in the Bruins’ Spring Showcase at the Rose Bowl on April 24, 2015. 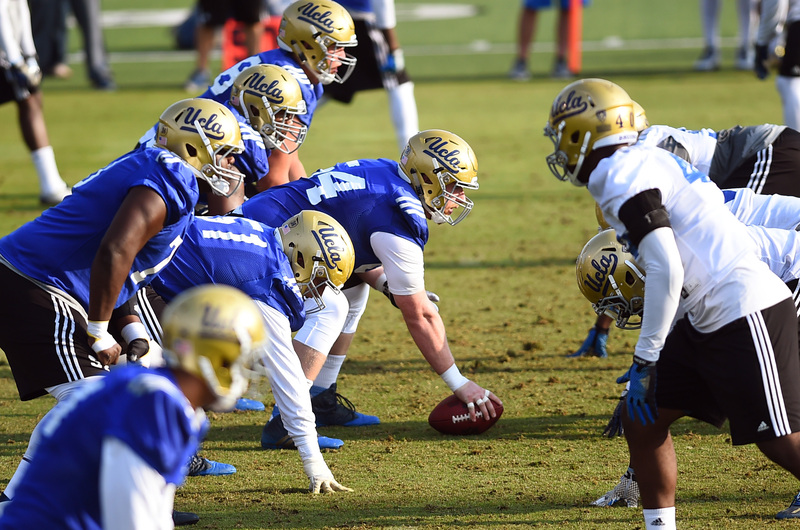 In today’s edition of Los Angeles News Group papers, I covered a few of the things we did and didn’t learn about the UCLA football team through 15 spring practices. If you missed anything else that happened this month, here’s a recap.